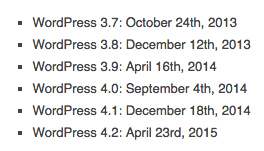 WordPress has been doing a lot of updates recently. This is because not only do they need to make sure their users have the latest gizmos and gadgets, but also to make sure our blogs are safe. And there have been lots of little updates in between to make sure things are topped up. 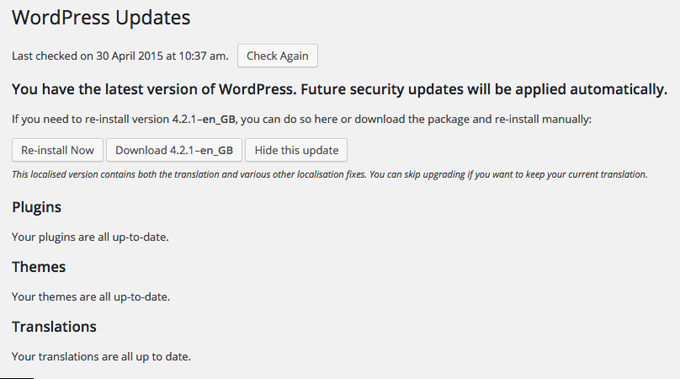 The latest chance to update your blog to WordPress 4.2.1 happened only recently. They say on their blog that it is due to “a critical security release for all previous versions and we strongly encourage you to update your sites immediately”. Some people are lucky enough to get their updates done automatically, usually for the minor updates. But all the major ones to require a manual update. When did you last update your blog? And this is an indicator for you to investigate what needs doing. If you don’t regularly update your blog, which includes not only WordPress, but also your plugins and themes, you could be leaving yourself wide open to hackers. Also you may find that you won’t be able to perform simple functions you could do before. Like updating your ‘Customise’ options under ‘Appearance’ or even the ability to upload images into your posts and other editing facilities. Help, my blog has gone all funny! Before you cry down the phone to your web developer, take a look to see whether anything needs updating or not. It’s always a good idea to try and work things out yourself before you resort to specialist help. Of course I knew exactly what was going on here, because I had experienced similar problems before. It’s always a good idea to explore the most basic remedies before launching into more complicated possibilities. A bit like making sure the plug is fully in the socket when your washing machine stops going round. Now I know how nerve-wracking it is to do things like updating. This is probably why so many blogs are not updated on a regular basis. When I knew everything was OK again. Even I have a knot in my stomach when I update my blog. But it has to be done! 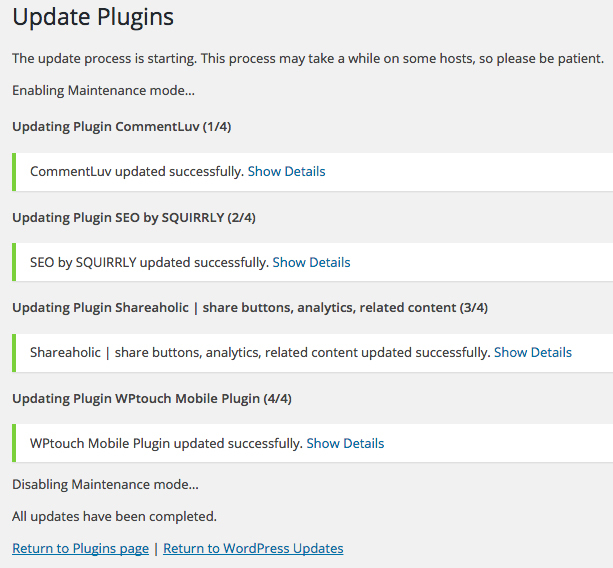 Once you’ve entered your Updates page, you will see whether WordPress, your plugins or your themes need to be updated. 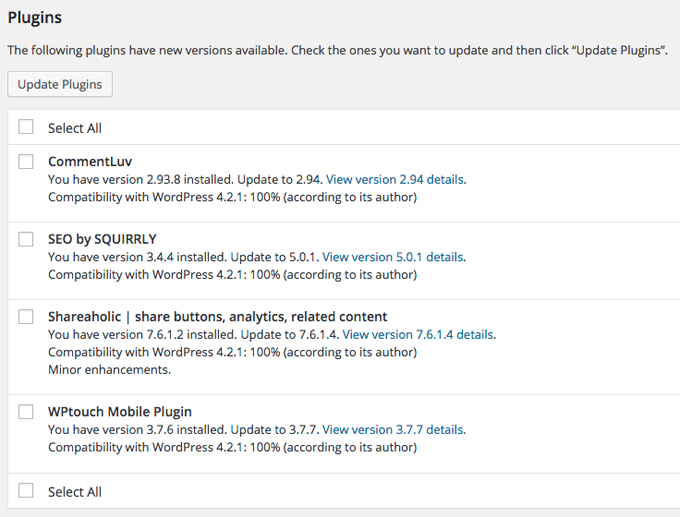 And if your WordPress is not automatically updated for you, this is the first update you should do. There is a reminder to backup your blog. This is very wise. Sometimes things can go a bit funny with an update. Only sometimes. So it’s best to be safe with a backup ready to be restored should the worst happen. Go ahead and click that blue ‘Update Now” button! Once an eternity has passed, you will first see a message from WordPress telling you what is included in this latest update. Unless you’re techie enough to understand what all this means, I would accept that your blog is now much safer. This is a good thing to see! But there are still the plugins and the themes to update! And click that ‘Update Plugins’ button! If your theme is any good, you will get plenty of update notices. It is wise to keep it up to date, or you may find things don’t happen as well as they should. And you’ve managed to fully update your blog and it is ready to go! This article was syndicated from Business 2 Community: Update Your Blog, or Pay the Consequences!